Earn up to 7,200 reward points. Get stage-ready power in a portable, great-sounding 2x10 combo. 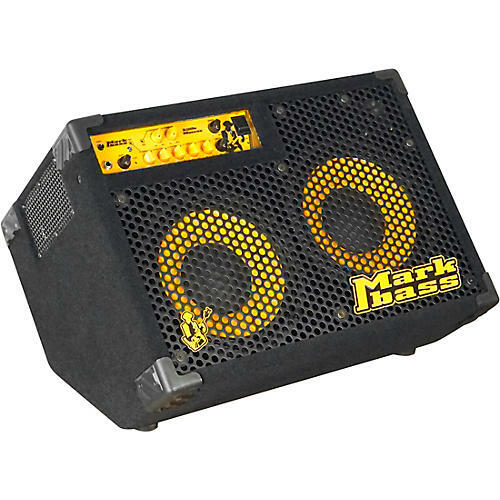 The Markbass Little Marcus 500 CMD 102 500W 2x10 bass combo features a 500W version of the Little Marcus head, delivering also a highly- portable size thanks to its unique and innovative design. The wedge cabinet design allows to use it in an angled position, offering to you the best monitoring on stage. This 2x10” combo is a great option for gigging bassists who love the attack and tone of 10” speakers. Its ultra- compact and very portable design and the 500W@4ohm of its Little Marcus head are the perfect power to cover any kind of gigs by just with this combo without to carry a big rig. The Little Marcus 500 CMD 102 is a highly versatile combo. The five-band setting on EQ1, from ULTRALOW to HIGH and the built-in Old School and Millerizer filters allow a wide range of tone, from vintage to Marcus unique slap voice. About all the bass amps on the market use the same power amp from different manufacturers, which are not specifically designed for bass. At Markbass, Marco De Virgiliis invested a lot of resources in R&D to develop a proprietary power amp technology, specifically designed to respect and glorify the tone of your instrument. The angled cabinet design allows the unit to be used either as a floor monitor or in standard position. The angled position is fantastic in applications where your amp is mostly for your personal monitoring, so you can perfectly hear yourself on any stage. Dimensions: 23.18" x 14.33" x 16.45"